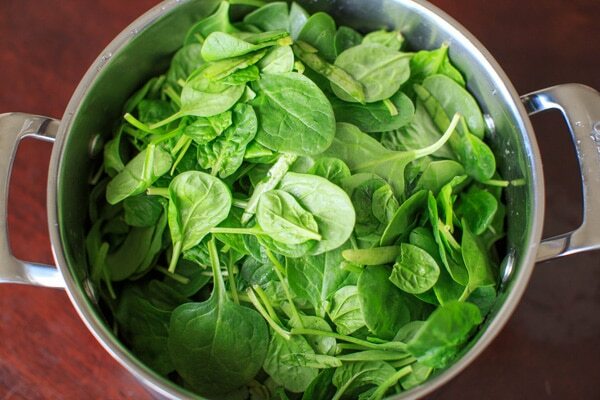 How to substitute fresh spinach for frozen spinach! 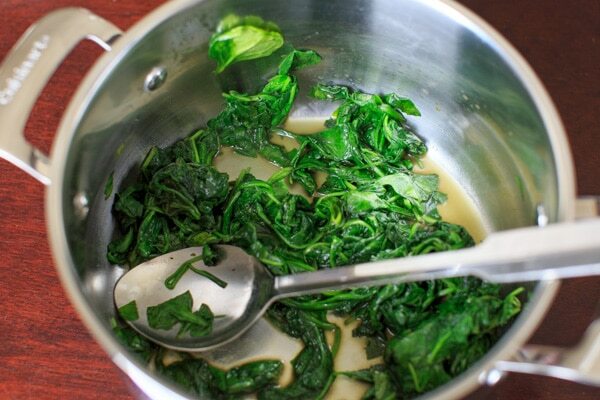 Or, a simple way to saute spinach for an easy side dish. Several recipes I’ve attempted lately have called for frozen spinach. I love spinach, but I have some trouble getting flavorful dishes when I use the frozen spinach. For example, I’m going to blame frozen spinach for the “healthy spinach artichoke dip” debacle that looked and tasted nothing like dip is supposed to taste. It was before I started the failed recipes series so I unfortunately don’t have photographic evidence. I was starting to think I should avoid recipes that call for frozen spinach altogether when I realized it shouldn’t be that hard to substitute fresh spinach leaves instead! Obviously it’s a bit easier to use frozen spinach rather than cooking down fresh. But if you’re willing to take the extra step, your tastebuds might thank you. Frozen spinach is usually boiled or blanched, but the method I use is to saute it. 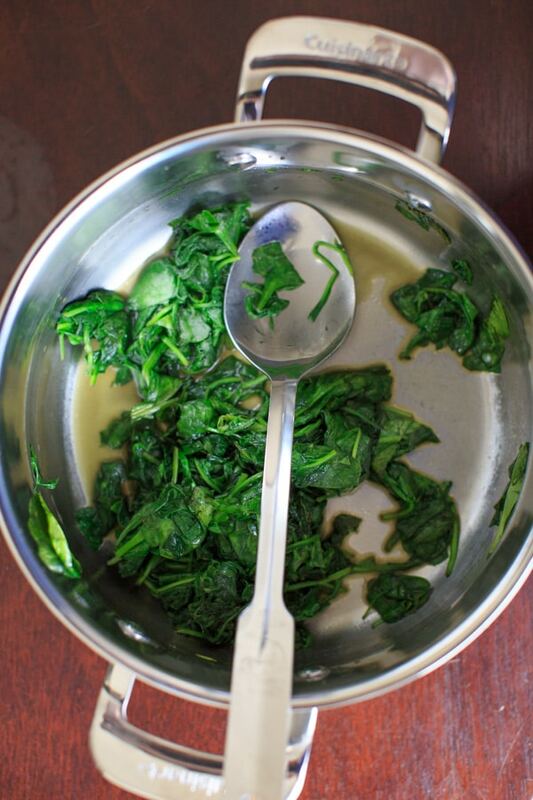 If you’ve ever sauteed spinach before, you probably learned that it cooks down a lot. Here’s what I started with (for perspective, this is 11 ounces of baby spinach in a 5-quart pan ). After heating 1 tablespoon of olive oil and sauteeing your spinach for 5 minutes, this is what you’re left with. Where’d it all go?! 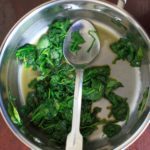 If you’re using this sauteed spinach as a side dish you will want to add salt and pepper, garlic, butter, lemon juice and/or other flavor. If you’re using in place of frozen though, just a pinch of salt will do before you squeeze out as much remaining water as you can through a colander. I’ve seen different conversions, but it is my understanding that a 10-ounce package of frozen spinach is equivalent to 1 and 1/2 cups after draining, which is roughly what you can get from cooking down 1 pound of fresh spinach. In the above pictures I used just 2/3 of a pound (11 ounces), which already filled my pot pretty well. If you have trouble fitting all the spinach into your pot, cook a little bit of the spinach down for a minute and then add the rest. 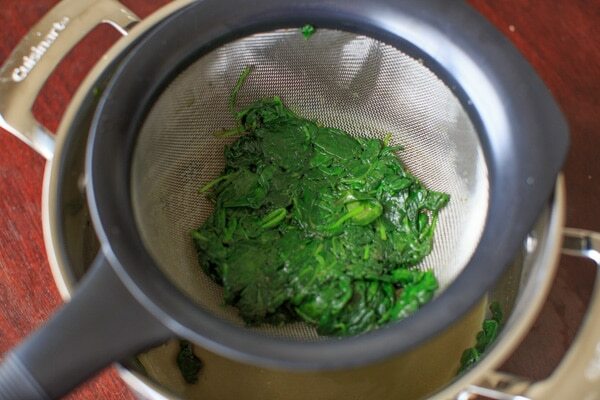 Drain extra water/oil from the spinach using a colander. You'll be left with about 1 and 1/2 cups of cooked down spinach, which you can substitute for a 10-ounce package of frozen spinach in a recipe. Enjoy! *For perspective, the pictures I used in this post are using 1 package (11 ounces) of fresh baby spinach leaves, not the 1 pound equivalent in this recipe. If you're having trouble fitting all the spinach in one 5-quart pot, cook down some of the spinach for a minute before adding the rest. 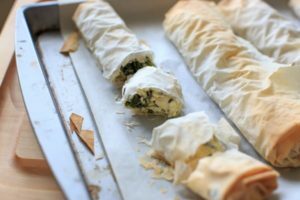 You might like to use this recipe for these spinach phyllo roll-ups! Great tip!! I grow a ton of greens in my garden, so I am always using fresh instead of frozen. I usually blanch and squeeze them out, but I love this method too. You get a little extra flavor with the olive oil!! I would love to have your fresh greens in my garden! Unlimited spinach sounds like a good life. Hi Denise! Some recipes it would be okay to use fresh spinach when you’re baking (I’m thinking like calzones). But others that call for frozen spinach require the spinach to be cooked down and more concentrated by volume (you can see how much spinach cooks down when the water is gone!). Frozen spinach is typically blanched and doesn’t have that much flavor, so this is the way I like to substitute fresh spinach for those recipes. Hope that helps! I’m having trouble figuring out how much 2 cups of fresh spinach cooks down to. On my diet I’m to have 2 CUPS (NOT ounces ) of greens. After cooking, how much (measurement) of spinach can I take out and eat.? 1 lb of fresh spinach leaves is about 10-12 cups. So if you’re trying to get 2 cups of fresh, that’s about 1/5 – 1/6 of this recipe! About 1/4 cup of the cooked down version.